The new butterfly light vegetable crisp. 24 calories per pack. Perfect for lunchboxes. Naturally packed with nutrients, zinc, iron, B vitamins & iodine, a nutrient missing from most foods, vital for wellbeing and effective metabolism. Suitable for vegans and gluten free. 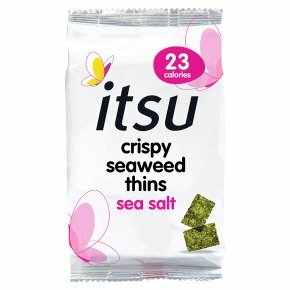 Contains 3 servings Do not eat silica gel (used to absorb moisture and keep the seaweed crispy).